Sorry to hear about your case of confusion and cognitive dissonance, Peter! Peter, it's really impossible to overstate what a breath of fresh air you are right now. Those of us who have been following your blog and the rest of the paleo world for the last two and a half years have seen a backlack-to-the-backlash-to-the-backlash thing happening regarding Taubes and sugar etc. (When you have people who had formerly recognized the problems with fructose reverse course and declare it "perfectly fine as long as you aren't hypercaloric," you know things have spun out of control.) So, it's just great to have you pinpricking the balloon (or pulling back the pendulum). Good work. Even if Leon Festinger was around to settle this, I'm pretty sure Dr G would still fail to see your point. So, like, chill out, man. Let go of the hate and go and eat a potato. Or something like that. I am beginning to think that within some limits, everyone is right, and thus a lot of what is written is simply meaningless. What I have observed are about three things. 1. Satiety is more pronounced with calories from fat than from carbohydrates. Hence, one stops before over-consumption. Fewer calories. 3. It doesn't matter what you eat, exactly, the problem is NOT BEING HUNGRY for some (extended) period each day, or several days each week. Being hungry after a meal of rice or wheat leads to unpleasant feelings. It's not so bad after fat and protein. Which brings me to the real problem: It's the too frequent eating. People have been too successful at avoiding hunger and the body is constantly, without rest, dealing with digestion and using calories from the digesting food, never in a resting state, and never having to actually use the fat stored on the body. That regular use of stored fat is part of the design of the organism. It isn't that carbs make you fat, exactly, it's that they make hunger unendurable, some of them are quite tasty, leading to over-eating, and they don’t make you feel full like fat and protein. It takes a while to get off the carb "wagon." But that is a separate problem. The same goes for sugar and the extra-bad version of sugar, fructose: It isn't that your body cannot deal with them, because it can, but dealing with them every day just exhausts the coping mechanisms. And if the caloric intake is sufficient before consumption they will make you fat. Similarly, in terms of obesity, if the caloric intake and needs of the body are in balance, then all is well. But it is probably the long-term history of the species that such a balance was difficult to maintain. The mechanisms and means of digestion are not really the issue. Digestion, as a constant state, is the problem. Oh Peter you mere animal vet! When will you stop questioning the opinions of your betters who have PhDs from esteemed global institutions? Why on earth do you dare confront the diktats of the wise? When will you obediently submit? Repent, Peter - kiss Dr. G's ring. You poor confused gluttonous thing you. Just who do you think you are? Say this to yourself 10 times every day "I'm fat and confused, fat and confused, fat and confused." We all know what increases fat tissue LPL, the dreaded *i* word. This study makes me wonder, does skeletal muscle LPL protect you from fat gain? Bottom line, macro-nutrient ratio's and gene's control body composition, not calories. BTW, Has anybody ever found a controlled over-feeding study that compared high-carb to ketogenic ratio's, preferably in humans? I see a pattern here though. 2008: The controlling Swedish authority (SLV) was adamant that their low-fat dietary advice was based on "thousands of studies"(1). Sounds impressive, no? 2009: After some blogger / dissident* badgering, the SLV makes the mistake of actually publishing the list of studies that support their advice. It consists of 72 studies (2). I guess that´s what we call "shrinkage". They also made the mistake of providing references, and much joy was had (3). "In the editorial section the dietary debate is back. Again a credentialed group of critics have signed a piece that is critical of the dietary advice of the SLV. The strategy of the SLV appears to be inscrutable. Why doesnt´t the SLV make the effort to give the critics viable answers? It is not credible to first claim that dietary advice rests on "solid scientific ground", only to then be unable to present or discuss that scientific work." *Sweden was lucky enough to have some dietary dissidents with impressive-sounding titles. In other news, macronutrient ratios have been removed from the official Nordic Dietary Guidelines. They still limit those nasty trans- and saturated fats though, luckily enough. Phew. Why does Guyenet continue to embarrass himself like this? Doesn't he care about his professional reputation? He gets away with it constantly, too. Major and minor errors. Or lies. @Richard Hunger is a symptom of abnormal energy use/body fat growth. Being less hungry is not always the goal, although for most of us with glucose metabolism disorder a lack of hunger is a reliable sign our bodies are working appropriately. There are many instances where lower appetite relates to body fat gain, for example in hypothyroidism the slowing of all metabolic processes will typically depress the appetite but body fat may increase (and well being/energy will nosedive). Of course there are many healthy young people with resilient metabolisms who have wolf like appetites and love food and can't gain weight. Some studies have demonstrated these types fail to gain even a small amount of fat, even when overfed hundreds of calories for days (more common is to gain a little fat, and experience intense nausea/vomiting/food aversion). I've observed many animals in zoos seem inordinately obese/flabby compared to their wild counterparts. I suspect this is related to feeding them excessive carbohydrate in prepared feed mixtures. I wonder if Peter can elaborate. Starving the animals every 7th day is much more cruel than simply feeding them the proper diet they require...but who am I to talk, my job involves force feeding demented diabetics human feed mixtures which aggrivate hyperglycemia like a mofo, which I then treat with insulin injections. I WIN AT LIFE! I do so love the smell of Napalm in the morning! "I don't suppose reading the studies matters that much in obesity research." You didn´t have to read the study - just your post. Lulz. "napalm", yeah, and cordite and "claret"
Thanks for hashing through the paper. I was disappointed to hear the diazoxide group in the first paper started out with lower insulin. In any case, it's still consistent with the theory that insulin is in charge. I can't imagine the author didn't notice the differences between groups in the second paper. Reducing insulin is the whole POINT of diazoxide. I don't think there is enough ignorance in the world to account for the authors not having noticed. I noticed the difference skimming the paper in 30 seconds. It was the first thing I looked for. "One problem is that the finding has not always been replicated by other investigators (7)." Oh sweet Jaysus! Total annihilation. This is a perfect example of what I mentioned in the comment of the last post. These people present evidence and arguments that are usually true, but what they present is *not* a direct counter. I don't know if it is stupidity or disingenuousness, but it does help build a [unintelligent] following, "Hmm, Stephan said *something* right; Peter must be wrong." I never quite understood the popular "carb spares protein" sentiment, because in most data I've seen, protein intake goes along pretty well with muscle mass (with adequate mineral intake). I remember Masterjohn had a post about eating steak or potatoes with butter (playful joke about the 5% protein keto mice) because the keto mice had lower "lean mass," but the same thing happens with low protein, high carb, as you show. Also, I saw one study where low protein lowered cerebral metabolic rate, but only when the remaining calories were carbs. Funny thing is that Stephan has yet to be refuted by anything Peter has said. 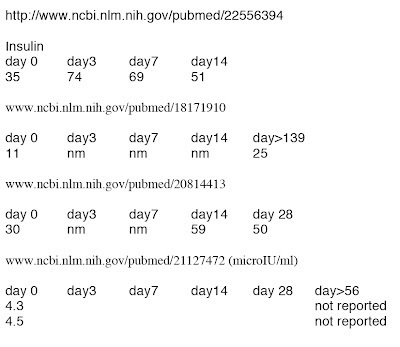 Great job showing that insulin trends in a downward fashion when weight gain follows the same pattern (i.e. rate of weight gain dictates fasting insulin). You have yet to show any cause and effect, meanwhile Stephan has presented numerous studies/anecdotes/historical facts that show insulin is not the dictator of fat, but just a method of communication( just like free radicals are in the mitochondria). You take away insulin and obviously there will be problems (just like lack of growth hormone makes you a midget), but manipulating it through a low carb diet is not gonna do anything special for weight loss. We have normal physiological ranges for a reason! "Here in Peterborough, the poorest people seems to be often the most obese on a quite unpallatable diet of pop soda, macaroni and cheese (or cheese-like spread)." Shows you don't understand the dichotomy between reward and palatability. "Shows you don't understand the dichotomy between reward and palatability." I file incomprehensible stuff like that in my doof drawer. Like others that criticize here, it seems as if you read only this post, since the last several have consisted of a variety of evidence. It is somewhat difficult to decipher the cause-effect relationship because insulin is coupled with appetite, but did you even read Peter's link to his original post? The *rate* of weight gain follows measured insulin; if insulin was a result of fat gain, it would continue to increase with increasing weight, but it does not. The following seems to have become popular: "Normal/healthy people [with normal/healthy insulin dynamics] don't become fat due to their insulin!" Cool, now we have another meaningless tautology to add to, "You need a calorie deficit to lose weight! 'Excess' calories are stored, regardless of source!" "The *rate* of weight gain follows measured insulin; if insulin was a result of fat gain, it would continue to increase with increasing weight, but it does not." Why does everything have to be so proportional? Remember the diazoxide paper and how *proportionately* the decrease in insulin didn't line up with weight loss? You said, "Why does everything have to be so proportional?" I don't see the point of that statement...One would expect insulin levels to rise with fat gain if they were the result of that fat gain. That paper is just one piece of the puzzle. And regarding another piece, yes, diazoxide has multiple effects without perfectly predictable results--good thing my ideas don't hinge solely on the results of that one specific diazoxide paper you mention. I did give you more than that anyway. I'd rather not overtake the comment section with arguments that have been repeated many times over. You can read and decide whatever you like. I've have experimented long term with both high-fat and high-carb (tubers and fruit). I will say this, as somebody who has run on average about 70-80 miles a week since 2007 that when you are relying on CHO you become one stressed out MF'er and weight and muscle mass is hard to maintain than with high fat. Indeed when you read the training diaries of elite runner's you find a lot of mood swings and this constant battle with oneself. All pointing towards the derangement that arises when you rely on a lot of CHO without the stressful athletic pursuits. I'm reminded of the great coach Arthur Lydiard of New Zealand who coached the likes of Peter Snell a world record holding 800 meter runner. In a 3 hour audio lecture he stated eat plenty of meat and milk and vegetables... he said... don't eat the starchy stuff... you don't need it. I had pointed out a long time ago in one of the posts Peter did on ketosis that prior to the growing industrialization of Kenya the runners there had much longer and conistent careers eating a higher fat diet. Now it's much different. Runners are burnt out in 2-3 years. Then I read accounts of Dr. van Aaken a German coach in the 50's and personal accounts of Gordon Pirie a world record holding UK runner who talk about the proper diet for a runner and they all are higher in fat with very little CHO. This of course contrasts with the high CHO culture of endurance athletes. And that culture is one strung out bunch of human beings. Obesity research is a joke. When we take people and put them on a high fat diet they loose weight without being hungry. EVERYTHING improves. That's good. It points to a mechnism that works. I mean look at our digestive systom everything points to an ability to digest highly nutrient dense food. And I've looked at our digestive system a lot in the autopsies I've done. It's so delicate and smooth, looks like a nice pipeline to absorb fat and soft matter. Look at all the metabollic machinery in place. That stuff does not occur unless there is some significant evironmental pressure. Everything about fatty acid metabolism is more efficient and self regulated. Look how beneficial ketones are. They are very protective and a superior energy source. I bet if we made a graph plotting our increasing carbohydrate consumption along with our decreasing production of ketones we would find a nice correllation between decreasing ketones and diseases of affluence. This also corresponds nicely to the outbreak of metabollic derangment at the start of the agricultural revolution. I've said it before in other places. If I was out alone, I would not spend any signifant time second guessing safe food sources when I could perice the heart of an animal and be satisfied for days. Everything else just gets you by until the next kill. CHO makes you fat, stressed out, and a rather unpleasant and tempremental individual. The other thing is this: Think about how smart you have to be to track and hunt an animal. Any idiot could dig up a potato. Hmmmm... idiots and carbohydrates... seem to go hand in hand. Seems that learning how to make traps and the coordination to required to kill an animal seems like a very plausible way to force brain development, especially when you are much much slower than the animal you are hunting. It requires teamwork, coordination, etc. All things that would select for more intelligence. I like to think of it like this: When you light a charcaol grill unless you dump a liter or two of lighter fluid on the coals and watch and tend it, it will go out. But if you set up the coals with a little fiber stick and wait patiently it lights up slowly but once it's going you don't have to worry about it. I prefer waiting the extra few minutes for it to heat of evenly than a large explosion and die off. Slow intense burn I prefer. @Steven J: "...you don't understand the dichotomy between reward and palatability"
Merriam-Webster defines Dichotomy as "a division into two especially mutually exclusive or contradictory groups or entities"
So are we now to understand that reward and palatability are mutually exclusive or contradictory terms? Curiouser and curiouser. Now I am even further from understanding these concepts as used by Stephan. Perhaps Stephan is loathe to define these terms clearly for fear that would leave him open to even more critique? Vague, specious, disingenuous half-truths are so much easier to defend. My single biggest issue with the Food Reward (FR) idea is the claim that it is NOT about sugar and refined starches per se but rather simply foods that lead to eating an excess of calories. In which case (as I have now asked, without response, several times on blogs that support FR) where are the examples of "rewarding" foods that do NOT contain sugar and/or refined starches? Because I can think of several examples of apparently "rewarding" foods that contain neither Fat nor Protein. If it were simply an excess of calories then surely there must be some examples. Wouldn't such examples strengthen the argument against excess fat storage being down to the long term effects of insulin on a diet rich in sugar and/or refined starches? Especially given that Fat (on average) has over twice the calories per gram of Protein or Carbs? Meantime Stephan -- who reportedly has access to a mountain of supporting evidence for this hypothesis -- proffers as a "final nail" in the coffin of the Carbs->Insulin Hypothesis a week-long trial of infusing rodents with insulin and he suggests that this models chronic hyperinsulinemia in humans with Insulin Resistance! Seriously if that is the best he can offer with access to so much evidence then I am far from impressed with his integrity as a scientist. He clearly has an agenda and while many seem keen to dismiss the likes of Gary Taubes because he makes money from writing (that is his job), and yet Stephan as a "real scientist" is apparently immune to such mundane external pressures as paying the bills. He is not swayed by the promise of research grants, tenure, speaking fees, honoraria, drug patents etc... while all he has to do is say the right things to keep big business and the "establishment" happy. I guess you can see why I no longer read his blog. He has a lost all credibility. You raise some interesting points, particularly about the unconscious motivations that might drive people. Having initially arrived here a good while back during the height of 'Paleo', I was struck by how Peter was quite open and clear about his open biases and would then proceed to use the hard science available to him to justify those biases. Perhaps not such a bad thing really. Now the really interesting thing to me was that Peter never was a 'Paleo' man. He was merely adopted for a period by the Paleo mob because what he said chimed neatly with the 'group think' of the time. And that's the thing really. Peter has never claimed to have THE answer, he merely (and quite openly)focuses on A answer, according to his own bias set (not setpoint). Now, it is true that a scientist should be adaptable enough to follow the science and not the personal bias, but I must question the seeming aimless chasing of THE answer. So, does that mean that Peter is out of kilter with science? I don't think so. Why do I think what I do? Well, Peter has no research funding to chase. He isn't even a 'bona fide' human condition scientist - he's a vet. He has no book to publish, nor any following to grow. He has no personal gain to make from any of his views, yet he sticks by his views because he believes (and shares with us) the hard science that he so smartly dissects for us here - and we can follow the links provided back to check for ourselves. I used to regularly read Stephan, but became confused by the change of focus and tone and the seemingly 'middle of the road' views that offer the glimmer of THE answer, but always shrouded in more 'ask the expert' focus. You could swear that the way things stand now, that there is no apparent reason why we have an obesity issue around the world. As soon as some progress is made and by default, vested interests are endangered, THE answer changes yet again. I think I'll stick around here a little longer as the science seems honest.
" That paper is just one piece of the puzzle." So just ignore what i say because it's only ONE piece of the complicated puzzle. "And regarding another piece, yes, diazoxide has multiple effects without perfectly predictable results--good thing my ideas don't hinge solely on the results of that one specific diazoxide paper you mention. I did give you more than that anyway. " Ah ok, so since your ideas don't hinge on a SINGLE paper, let's just throw that away because it's only another ONE piece of the puzzle. Hey, while you're at it, why don't you throw away any evidence that lies contrary to your beliefs? Yea, when i wrote up dichotomy i knew that it was not a perfect fit, but I figured people would forgive me for it and get the gist of it. Guess not. one of the papers you mentioned states this conclusion:"Glutamine supplementation induces insulin resistance in adipose tissue, and this is accompanied by an increase in the activity of the hexosamine pathway. It also reduces adipose mass, consequently attenuating insulin resistance and activation of JNK and IKKbeta, while improving insulin signalling in liver and muscle." you decide to cite a paper where the conclusion that is contrary to your viewpoint. Or does the statement, "It also reduces adipose mass, consequently attenuating insulin resistance " suggest anything other than fat modulating insulin and not the other way around. I think we are about of the same point of view here. Carbs are not poison, but only in the sense that the dose makes the poison. The body can in fact digest almost anything, since the goal is survival and reproduction. It does seem that people are meant to "run" best on a higher saturated fat diet. All of these studies showing that people can eat and digest and metabolize and not gain weight? Or that if they eat to much they do gain weight? What's the point of belaboring the obvious? Or the best distraction yet, whether insulin is a cause or effect or is simply correlated with weight gain? Or not? The mechanism of digestion is, as I see it, somewhat beside the point. The question is how to keep the organism able to react as it would in a more natural state. Constant feeding is to some extent unnatural. @Edward J. Edmonds, re: "EVERYTHING improves..."
The Sun's nutritional expert is retarded. LOL, great stuff Peter. Somewhere in Washington someone's blood pressure is surely boiling. tiago: Great stuff on the diazoxide study. It's amazing how much a person's bias at any given time can effect their interpretation of a study. nothing91: I really believe he knew that study was flawed, but used it anyway as supportive of his point. He must have believed or hoped no one would remember what he wrote in the past. What reputation? Guyenet is basically a lab technician with a handful of co-authored papers. "Steven J" is obviously Stephan J Guyenet wearing a very flimsy disguise. As Palatability increases, initial Reward increases. This allows for increased Consumption before Reward reaches zero, for any given value of fillingness. As fillingness increases, the downward slope becomes steeper, so Reward reaches zero at a lower value of Consumption. CIAB has been engineered for maximum palatability with minimum fillingness, so that Consumption is maximised before Reward reaches zero. It's also engineered to produce minimum satiation, which minimises the time to repeated consumption. Real food is palatable but has higher fillingness, so Reward reaches zero at a lower value of Consumption. It also produces higher satiation, which increases the time to repeated consumption. I didn't "ignore" anything. Those two "pieces" *support* what I said, yet I *wouldn't* be *convinced* by either in isolation; that's pretty much the opposite of biased. You brought up a different diazoxide paper, which I am already aware of. When some diazoxide papers fit in with other observations, yet one stands alone, you got to make a choice somehow. Or, do you then go on Stephan's blog and present diazoxide papers that *support* the insulin hypothesis?...That's what I thought. The glutamine reduces insulin's influence on the adipose, and fat loss consequently occurs. I don't know how you're interpreting that. Talking for two people is a bit presumptuous don't you think? "The glutamine reduces insulin's influence on the adipose"
"and fat loss consequently occurs"
...and you're arguing it reduces weight. Interesting you attribute that to IR and not the increased adiponectin levels or whatever else..
Keep drawing foolish conclusions about me. Meanwhile I'll just keep laughing at your misinterpretations of studies. Ahh, the great evil of the all-encompassing, ambiguous "insulin resistance" --Now it's clear why you're a Guyenet groupie. Adiponectin overexpression leads to fat storage suppression and higher fat oxidation, even with a "high fat," [high palatable and rewarding] diet. I would say that adiponectin makes food taste bad and less rewarding, but the mice don't eat less. I guess it just lowers their set-point. 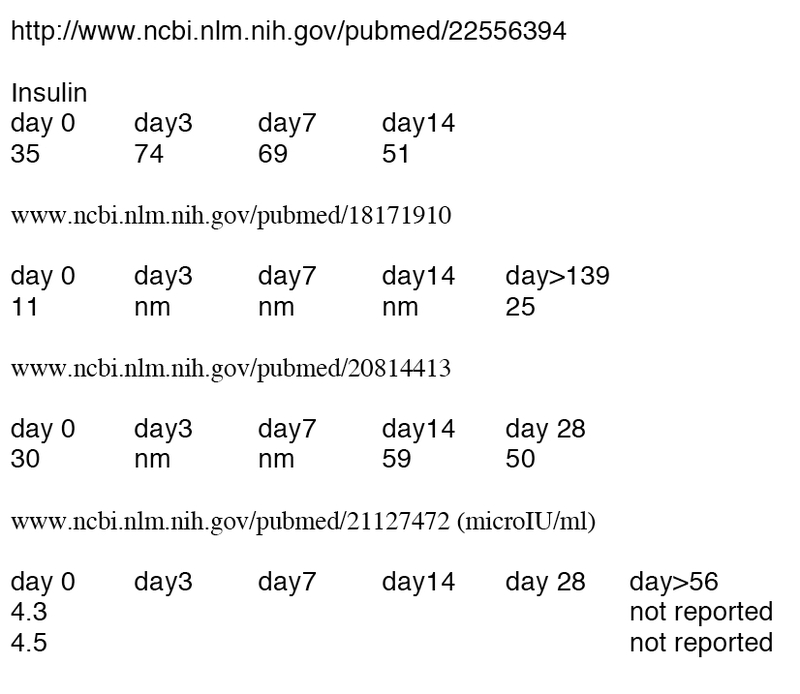 "Meantime Stephan -- who reportedly has access to a mountain of supporting evidence for this hypothesis -- proffers as a "final nail" in the coffin of the Carbs->Insulin Hypothesis a week-long trial of infusing rodents with insulin and he suggests that this models chronic hyperinsulinemia in humans with Insulin Resistance! Seriously if that is the best he can offer with access to so much evidence then I am far from impressed with his integrity as a scientist." OMG! Has Dr Guyenet really written this? Talk about shooting fish in a barrel. I'm actually staring to feel sorry for the guy. If you have the citation from the Good Doctor and a juicy quote from the man we can have some (more) fun. Peter, who is just starting to find this a bit depressing! "In the first study, published in 1980 by Dr. Dennis A. Vanderweele and colleagues, rats were implanted with mini-pumps delivering insulin at a steady rate throughout the day and night for 7 days (4). They tested four different doses: 0, 1, 2 and 6 units per day, and measured food intake and body weight. This is a model of chronically elevated insulin reminiscent of what is seen in insulin-resistant people." The comments became quite heated and it was about this time that I started realising that he had lost his objectivity as a scientist. I notice yet another blog post today which echoes the sugar lobby tag-line of, to paraphrase, "obesity is not the fault of sugar per se but instead the issue is an excess of any calories". To me this is a clear case of "Say what big business want to hear in order to keep the research grants coming"
@Steven J: "...at least for its effect on rats(in the short term)"
That is precisely the point: the short term effects of insulin in an otherwise healthy individual is NOT the same as chronically raised insulin concurrent with Insulin Resistance (IR). By "chronic" I mean many months, years or even decades. And by "concurrent" I mean that the raised insulin both leads to and is worsened by IR. Put another way: if I took an healthy lean individual and injected insulin over a few days I would expect their body to compensate by secreting less insulin in order to maintain a physiological balance. The body is incredibly resilient in that way... however if I kept up that regime over many weeks or months I'd expect a damaging outcome. Or perhaps you subscribe to the strawmen that: the proponents of the CIH claim ALL carbs are evil and ANY amount of insulin will harm you Nothing could be further for the truth... but I suspect you already know that. He claims access to a mountain of supporting evidence, makes frequent appeals to the authority of his credentials, and often speaks as is he has the voice of the entire "research community" -- all of which immediately puts me on my guard; wondering why he thinks his evidence does not stand on its own merits. Given access to so much evidence then WHY on earth would he choose this study; which even I as "not a real scientist" like him, can so easily pull apart..? Clearly this is NOT a "model of chronically elevated insulin reminiscent of what is seen in insulin-resistant people" as he claims it is! Perhaps he "...knew that it was not a perfect fit, but figured people would forgive him for it and get the gist of it." " if I took an healthy lean individual and injected insulin over a few days I would expect their body to compensate by secreting less insulin in order to maintain a physiological balance." Less confusing? Or was that just another attempt at distraction? going one day per week without eating is not an appropriate use of the word "starving." When done deliberately by humans, it is lately called "intermittent fasting", and has been shown to be very healthy. As Dr. Davis said, grazing is for cows. As J Stanton says at Gnolls.org: eat like a predator! Unless you like drinking oils it is hard to eat ZERO CHO. But in general I do have a paranoid view of CHO. My joints start cracking if I go to high. But whether or not antifreeze at any dose is safe I'm not sure. As far as weight I think as far as obesity research is concerned--weight--is the wrong metric. @Stan had some interesting thoughts recently on his blog: "Unknown keto+glucose oxygen-sparing metabolism?" I tend to view these disorders through a evolutionary lens. We tend to view them as disorders but I'm starting to see these as selection pressure. I've read some case studies where people have peroxisome disorders and can't eat fat (VLCFAs & LCFAs). BUT, they seem to be treatable with ascorbic acid (but no idea about how that mechanism works). I haven't read about any cases where they can't eat CHO and it is corrected with anything but fat. That fat seems to be the failsafe fuel should be the first clue to the "experts" that there is something innately unique to carbohydrate. intermittent fasting is normal for all large predators. Big cats only eat 2-3 times per week in the wild. Food technologists have known for decades that best way to increase appetite is to produce soft, bland products high in refined carboydrates and low in protein and fat. In fact proprietary weight gain formulas are always low in protein and high in carbohydrate. @Jeffrey I did not mean literal starvation, obviously. 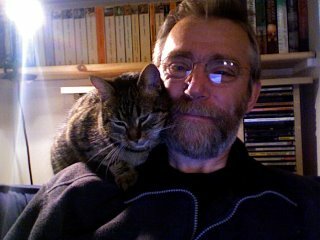 If blogblog is correct that large cats eat 2-3 days per week, I suppose then this is not cruel. That would be cruel, when they could feed the animal appropriately to its biology and eliminate the fatness as well as the need to withdraw food to produce artificial leanness. This is just as me tweezing my eyebrows (pulling hair out of my face on purpose) is not cruel, but pulling whiskers out of my cat IS cruel. The cat just knows it is in pain, and it doesn't want me to pull out its whiskers... but I am a human with control and choice, it is my perogative to subject myself to discomfort like pulling out my own hair. When I have to fast my cat, he is very miserable and will meow and look to his bowl. I imagined something like this happening. (wild) animals can still become fat even if fed a completely natural diet. Feral camels in the Australian outback have been observed to suffer from many obesity related illnesses (due to abundant food and no predators). An Australian zoo discovered that their lions were much more content when fed every second day rather than daily. This is despite the lions being fed a natural balanced diet (mostly freshly killed whole young goats). Peter, I wonder whether there might be an alternative explanation for the Knudsen results: a reduction in autophagy. The subjects were exercising less and eating more, so both exercise-induced and fasting-induced autophagy would have been less. Cells need to clear out the junk all the time. If beta cells don't, they would be less sensitive to glucose and also to feedback inhibition by insulin, which would explain the hyperinsulinemia. This insulin might have been inhibiting lipolysis, but equally it could have been the reduction in autophagy, which breaks down fat ('lipophagy') as well as everything else.